Grab your American flag, put on your red, white and blue, and celebrate America’s independence July 4, from 10 a.m.-10 p.m. with an Independence Day parade and celebration on the Square presented by Superior Plumbing, free live concerts, arts and crafts show, food, carnival games and the City of Marietta fireworks finale. Throughout the day, more than 80,000 people are expected to celebrate on the Square with great food, fun activities, the best arts and crafts around and free entertainment from Zach Seabaugh, a hometown boy who was a finalist on the hit television show The Voice. His popularity continues to flourish as he begins performing to growing audiences on bigger stages. Opening for Seabaugh is Presley Sullivan, a featured artist on 94.9 The Bull’s Backyard Country. Concerts are presented by 94.9 The Bull. The Marietta Independence Day parade is scheduled to include more than 115 entries with more than 40 floats and approximately 2,000 participants. Entries include marching units from the City of Marietta, civic organizations, beauty queens, scouts and local businesses. The parade begins at 10 a.m. at Roswell Street Baptist Church and travels west on Roswell Street, north on East Park Square past Glover Park and the Square, down Cherokee Street and ends at North Marietta Parkway. Visit the Arts and crafts show with nearly 100 unique handcrafted vendors: 10 a.m.-9 p.m. Enjoy lunch or dinner, or just snacking at the Food concessions: Anything to please the palate from ice products to cool you down to corndogs and BBQ to satisfy your appetite. 10 a.m.-9 p.m. The City of Marietta fireworks display is scheduled to begin at 9:30 p.m. and will be shot from the First United Methodist Church parking lot. If bad weather is expected, the fireworks may begin a few minutes early, to ensure the entire display is completed. If you want to watch the fireworks, make sure you get there early to grab a spot because traffic is expected to be heavy. Concert Tables: Concert tables are available for purchase in 8-tops and 6-tops for $100 and $80 respectively. Tables can be claimed beginning at 5:30 p.m. on the fourth and you can purchase one by calling 770.423.1330., or email Peter Jezerinac at pjezerinac@jrmmanagement.com. Celebrate the Fourth of July all Weekend! FRI JULY 3 KENNESAW’S FOURTH OF JULY – The City of Kennesaw’s Salute to America, Independence Day celebration will be held on Friday, July 3, and will feature FREE, high-energy live music and talented entertainers, plus one of the biggest and brightest star-spangled firework displays in North Georgia. The event is scheduled from 6 to 10 p.m. in downtown Kennesaw. From 6 – 7:30 pm on the feature stage in Depot Park, the United States Air Force Band of the West’s Concert Band will perform. This 45 member ensemble of Air Force professional musicians have a music repertoire from the Renaissance to the present day, featuring classical and Broadway music as well as Sousa marches and popular hits. From 8 – 9:30 pm, DEPARTURE, arguably the best, most respected Journey tribute band in the nation, plays all the hits of the ‘80s rock super group. The Atlanta-based band was voted “Best Local Entertainer” in 2014 by Gwinnett Magazine. Fireworks begin at 9:30 p.m., and will be visible from several locations throughout downtown Kennesaw. This event is free. 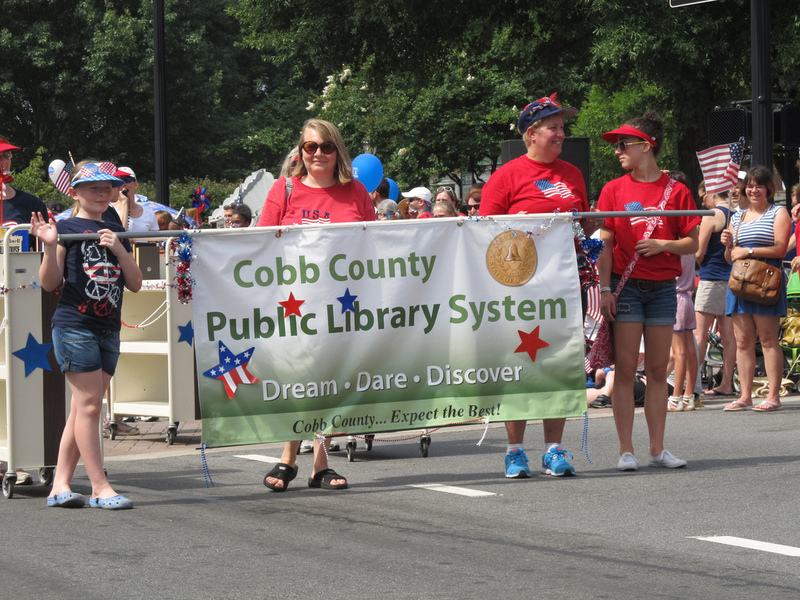 SAT JULY 4 – ACWORTH’S FOURTH OF JULY, Let Freedom Ring Live music and fireworks at Cauble Park. Live music with the Shreeps from 4-5; Paul Hand Band will start at 5:15 p.m. leading up to headliners “FLASHBACK” at 8:00 p.m. Fireworks will begin at approximately 9:40 p.m. Stay for more FLASHBACK until 11:00 pm. Admission to the concert is free; however tables are available for the July 4 concert. Tables are $50 each for City of Acworth residents and $70 for non-residents. With the table you get 6 chairs and one parking pass. This parking pass will allow you to park at Cauble Park as long as spots remain available. Parking at Cauble Park is by pass only on July 4 but you are not guaranteed a parking spot at Cauble Park with this pass so please plan on arriving early. SAT JULY 4 MARIETTA’S FOURTH OF JULY 10-10. Grab your American flag, put on your red, white and blue, and celebrate America’s independence July 4, from 10 a.m.-10 p.m. with an Independence Day parade and celebration on the Square, free live concerts, arts and crafts show, food, carnival games and Superior Plumbing fireworks finale. Throughout the day, more than 80,000 people are expected to celebrate on the Square with great food, fun activities, the best arts and crafts around and free entertainment from different local entertainers and even Universal Republic Nashville Records country star- David Fanning presented by 94.9 The Bull. Plan on spending the day and enjoy shopping over 100 craft vendors, food concessions, a Kid’s Zone, concerts and fireworks. Fireworks scheduled for 9:30 pm. SAT. JULY 4 POWDER SPRINGS FOURTH OF JULY 4:00 PM. Festivities start in downtown Powder Springs at 4:00 p.m. Free Admission, Free Parking, Free concerts, and Free Fireworks. Patriotic Program and Fireworks at 9:30 pm. THURS JULY 3 KENNESAW’S FOURTH OF JULY – The City of Kennesaw’s Salute to America, Independence Day celebration will be held on Wednesday, July 3, and will feature FREE, high-energy live music and talented entertainers, plus one of the biggest and brightest star-spangled firework displays in North Georgia. The event is scheduled from 6 to 10 p.m. in downtown Kennesaw. The “Night Fever” of the 1970s disco era meets the “British Rock Invasion” of the 1960s when Stayin’ Alive and Satisfaction take the stage on Thursday, July at the City of Kennesaw’s Salute to America. Stayin’ Alive takes the state at 6:00 p.m., followed by Satisfaction. Fireworks begin at 9:30 p.m., and will be visible from several locations throughout downtown Kennesaw. This event is free. FRI JULY 4 – ACWORTH’S FOURTH OF JULY, Live music and fireworks at Cauble Park. Live music with the Paul Hand Band will start at 5:00 p.m. leading up to headliners “FLASHBACK” at 7:00 p.m. Fireworks will begin at approximately 9:30 p.m. Admission to the concert is free; however tables are available for the July 4 concert. Tables are $50 each for City of Acworth residents and $70 for non-residents. With the table you get 6 chairs and one parking pass. This parking pass will allow you to park at Cauble Park as long as spots remain available. Parking at Cauble Park is by pass only on July 4 but you are not guaranteed a parking spot at Cauble Park with this pass so please plan on arriving early. FRI JULY 4 MARIETTA’S FOURTH OF JULY 10-10. Grab your American flag, put on your red, white and blue, and celebrate America’s independence July 4, from 10 a.m.-10 p.m. with an Independence Day parade and celebration on the Square, free live concerts, arts and crafts show, food, carnival games and Superior Plumbing fireworks finale. Throughout the day, more than 80,000 people are expected to celebrate on the Square with great food, fun activities, the best arts and crafts around and free entertainment from different local entertainers and even Universal Republic Nashville Records country star- Greg Bates presented by 94.9 The Bull. Plan on spending the day and enjoy shopping over 100 craft vendors, food concessions, a Kid’s Zone, concerts and fireworks. Fireworks scheduled for 9:30 pm. FRI. JULY 4 POWDER SPRINGS FOURTH OF JULY 4:00 PM. Festivities start in downtown Powder Springs at 4:00 p.m. Free Admission, Free Parking, Free concerts, and Free Fireworks. Patriotic Program and Fireworks at 9:30 pm.